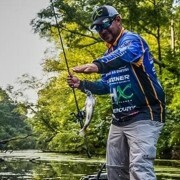 Find out the fast and simple ways to improve the guide wraps on your custom fishing rods. It’s no secret that great guide wraps take time to perfect. But although there is a slight learning curve to wrapping rod guides, there are also many proven tips that work instantly to improve your techniques, your tools, and most importantly, your finished thread wraps. 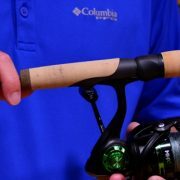 Tension is actually a good thing for guide wraps, but only when used correctly. 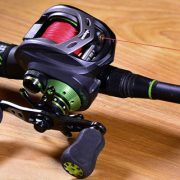 First, the thread will do its job of securing the guide to the rod blank – which is really important during the first several turns when the thread is moving from the blank up to the guide foot. During this transition, if the tension is too light, the guide will often slide out of place. If the tension is too tight, some guides might spring out from under the wrap – or may even break the thread (especially thread used for trim bands and decoration). Second, the right amount of tension – once all the guides are wrapped – will allow you to go back and make small adjustments to the guides to make sure they are in a perfectly straight line down the blank. Whether burnishing the thread to pack it tighter or adjusting the alignment of the guides, the right thread tension will allow you to easily work with the guides without undoing the thread wrap. Plus if you are using the CRB HWS-1 Hand Wrapper, then there are multiple features designed to help you establish and control the ideal thread tension. The CRB hand wrapper comes with a thread tension rod, which is manufactured to maintain thread tension on your wraps, cushion the thread spool pressure, and allow you to reverse your wraps without sacrificing any tension on the thread. So while you are wrapping a guide, you can reverse the rod blank and un-thread the guide wrap – while tension is still holding the thread perfectly in place. This is a huge boost that makes guide wrapping more user-friendly and efficient. 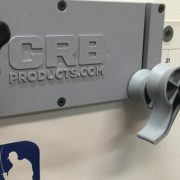 The CRB hand wrapper’s dual spool tensioner allows the use to simultaneously hold two spools of thread. More importantly, however, you can adjust the amount of thread tension you need by simple turning the wing nut. Tightening the nut applies more pressure on the spring that then makes it more difficult for the thread spool to turn. And you guessed it, the opposite occurs when you loosen the wing nut instead. 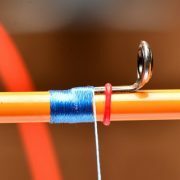 By controlling the amount of tension on the thread spool, you can control how tight or loose your thread will be applied over the rod blank and guides. Sometimes even your best efforts can’t keep threads from acting up. The most common of these issues happens after the guide wraps are finished. With the finished guide, you might notice thread nubs or tiny frays poking through the cured epoxy. Sure these are frustrating, but a quick rod building trick will remove these blemishes and produce cleaner finished guide wraps. After the epoxy finish has cured and hardened, simply take an alcohol burner or even a lighter in this case, and wave it over the excess thread emerging from the epoxy. The flame will quickly burn off the thread down to the edge of the epoxy and leave a clean, finished guide wrap. Taking advantage of the right thread cutting tools is also an easy tip that many builders tend to overlook. Avoid common issues with rod winding thread by simply using the proper cutting tool for the given job. Other than these two scenarios, the average pair of scissors isn’t cut out for working with rod winding thread. Mostly because the blades on a pair of scissors are often wider and duller compared to cutting tools designed to specifically cut thread in rod building. Thread clippers and razor blades are better for cutting thread because the blades are much thinner in diameter and as a result, much sharper to match. These thread clippers were designed with thin, ultra-sharp blades to cut thread with little to no fraying or splitting on the thread’s end. Made to fit comfortably in your hand and to quickly cut through thread, the thread clippers are a popular tool that rod builders have to have by their work bench. 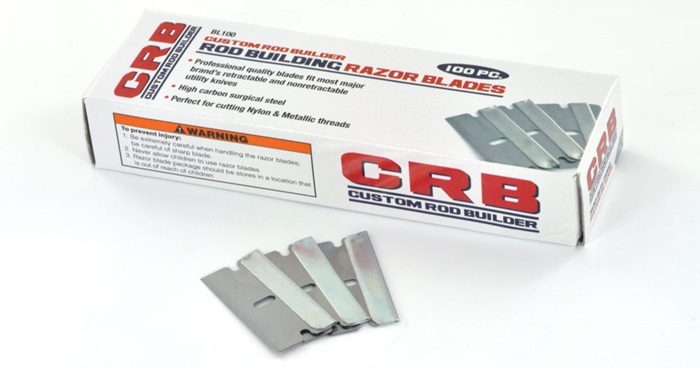 As you can see, the razor blade is the thinnest and sharpest cutting tool. This makes razor blades the best bet when trimming tag ends and running threads from guide wraps. 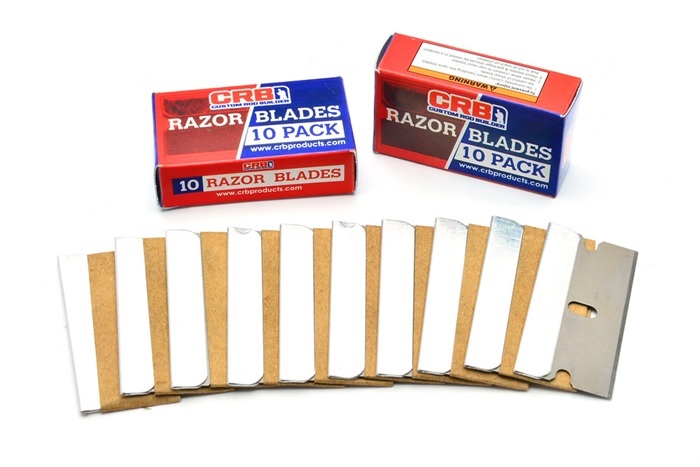 Simply lay the razor blade flat against the guide wrap with the blade facing the thread you want to cut. Then, take the thread and pull it towards the blade for a clean, smooth guide wrap that doesn’t show any extra thread nubs or frays. Stock up at Mud Hole and SAVE $$$! Hiding the tag end of both the starting thread and the running thread of the guide wrap is not only easy, it also comes with benefits for performance and appearance. For starters, hiding the tag end is easy because all you have to do is finish the thread wrap on the underside of the blank. Since this is opposite from where the guide sits, tucking the tag end underneath will make it virtually invisible to dramatically boost the wrap’s appearance. Plus for performance, hiding the tag underneath the rod ensures the wrap won’t loosen and come undone. Let’s say you leave the tag end over the guide foot instead, this can cause the thread wrap to slide, loosen, and ultimately, come apart. Practice, practice, and you guess it, more practice! Plus, it doesn’t hurt to upgrade your techniques and tools to increase your odds of improving those thread wraps. To get all you need for thread wraps and more, check out ProWrap Rod Winding Thread and CRB Cutting Tools at Mud Hole!